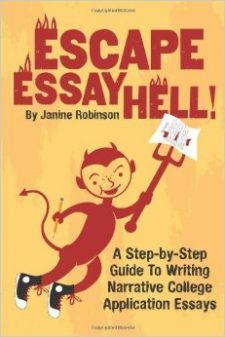 However, colleges are eager to hear about the obstacles students have faced, and their real-life stories of hardship, and these essays are the perfect place to share them. The best college application essays are almost always highly personal. TWO: Like many students—especially those who have grown up with some hardship in their immediate background or family—the best topics can be so close to them that they don’t recognize how powerful they are. Example: I worked with one student at this workshop who was convinced she had nothing worthwhile to write about herself. But after talking a bit, she told me her parents ran a small motel in the middle of nowhere and she helped them by cleaning the rooms. It took a while to convince her that writing about her life with that motel, or some small piece of it, could make a powerful essay. THREE: Many students who struggle to help their families often don’t recognize the admirable qualities they have developed, which they should showcase in their essays, such as determination, self-sacrifice, endurance, resilience, etc. They need to step back and look at the role they have played in their families and look for a story that shows their reader what they have done and learned. Example: One student I worked with to find a topic told me he had just started a job at a drug store. It took a while to draw out that a customer had come in drunk, and got angry at the student when he wouldn’t sell him cigarettes, and left threatening him and shattering the store’s glass door. I asked the student if he returned to work the next day after that terrifying experience. I asked why, and he said he needed to support his family. I told him that sharing that experience would literally show colleges much about what he was about and valued. FOUR: Students who grow up in a community that has it’s own distinct culture, such as the predominantly Hispanic Rio Grande Valley, often don’t realize that the traditions, lifestyle, history and culture can make great topics, or at least a rich backdrop for their stories that make them interesting and meaningful to colleges. Like any typical teenagers, to them, it’s just what they grew up with and believed wouldn’t interest anyone. But those details can make their essays sing! FIVE: Since some of these students only recently learned English or it was a second language, their mechanical writing skills were not strong. The most important goal for these students, I believe, was to first and foremost make sure their application essay did not keep them out of a college because it was poorly written and had errors and mistakes. These students needed to reach out to English teachers, counselors or others who could help them review and proofread their essays so they were error-free. If they also told a great story, all the better. SIX: Since many first-gen and underrepresented students learned English as their second language, their writing skills and confidence sometimes can be relatively weak. Because of this, they are convinced they cannot write well. It’s important to understand that good writing is not only about the mechanics (grammar, spelling, syntax, etc.). Those are mainly the means to deliver your ideas clearly and communicate effectively. The most important part of strong writing is what you have to say. Students who stick to telling their real-life stories using simple, basic language and words will find their essays are interesting and powerful. If they share how they feel and what they have learned, they will also be personal and memorable. If you will be the first to go to college in your family, or have a background as a minority (cultural, racial, sexual, etc.) and have endured any type of related hardships (poverty, discrimination, abuse or family struggles), you need to trust that you have stories to tell. Share one of those stories in your essay, and then tell how the experience shaped who you are today. Read this Jumpstart Guide to get going.